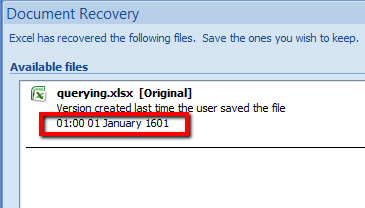 It felt like I’d been working on the spreadsheet for a long time but when Excel crashed and then, on recovery, told me I’d last saved it on New Year’s Day 1601 I had to wonder whether it was right. But only for a millisecond because, in fact, I’m an inveterate frequent saver. My fingers have been burned so much over the years by losing data due to crash, keyboard shortcut misadventure, server timeout, accidental browser closure and so on that I’m typing this with blackened stumps. Both 1900 and 1904 file types are commonly found in the wild, usually depending on whether the file originated on Windows or Mac. Converting from one to another silently can cause data integrity errors, so Excel won’t change the file type for you. To parse Excel files you have to handle both. That’s not just a matter of loading this bit from the file. It means you have to rewrite all of your date display and parsing code to handle both epochs. I had planned to write more but I realise I can summarise the remainder in one word: Sigh.